After a bit of a wait the National Library has gone live with its Australian Government Web Archive. The service allows users to access the archived websites in the Australian Commonwealth government domain. Currently accessible are harvests from June 2011, March 2012, March 2013 and April 2013. For content older and, in some cases, more recent than that available here, users should still access PANDORA. It is to be hoped in the long run that content from the previous Australian Whole of Domain Harvests from c2004 will also be available here and that there will be an integrated TROVE, PANDORA, AGWA search. But even as it is, the Digital Archiving Section of the NLA should be congratulated on producing this very useful service. With the anniversary of the start of the First World War looming, there is sure to be demand in public libraries for information to complete school assignments or otherwise to commemorate the events and in particular the soldiers who fought and died. While it is fine to remember and honour the service of those who went to fight, it is even more important to remember, commemorate and celebrate those who refused to fight. 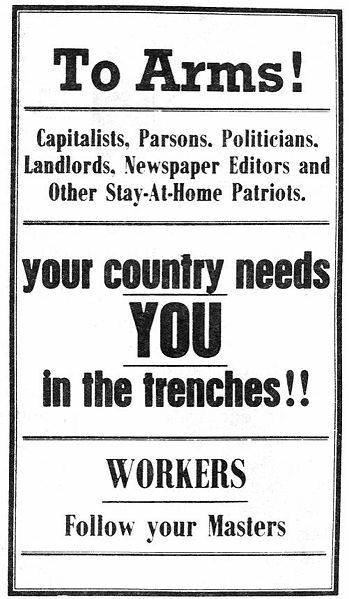 In Australia there were a range of political and social institutions who were opposed to the war and who jointly defeated government attempts to introduce conscription. Below are listed a few sources to assist those working in public libraries to provide their users with a range of useful resources. It is only a very small sample, there are hundreds more sources for the enterprising librarian to find. The war was destructive for Australia as a nation which lost not only around 60 000 of its young men, with many more thousands left wounded, deranged, shell-shocked and damaged in countless ways, but lost also a sense of itself as a confident, independent, global pioneer in creating an advanced democracy that drew the eyes of all the world to the new Commonwealth. Instead, Australia succumbed in the end to the demand for loyalty, the demonisation of reformers and the revitalisation of the forces of imperialism. 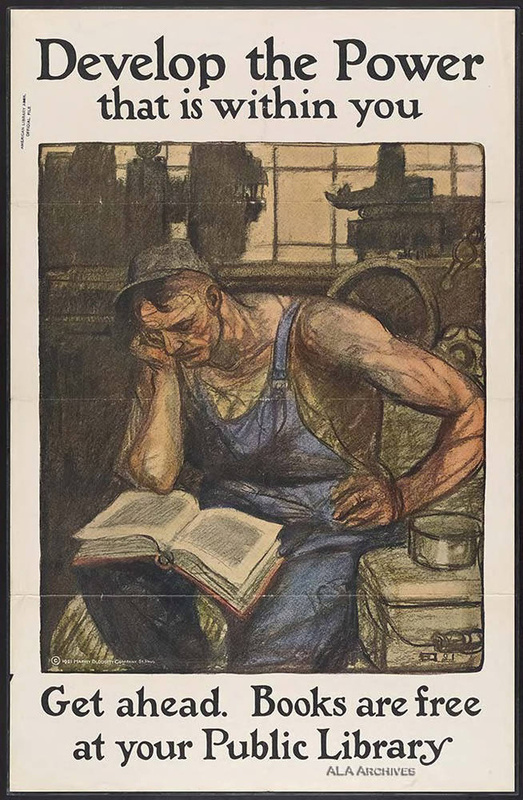 This 1921 poster from the ALA is very nice. On one hand it very much fits into the US self improvement through independent study ethos, as popularised by Andrew Carnegie and to some extent by Ayn Rand – though of course Randians these days don’t like any public services. The worker here is supposedly improving his chances at getting better employment by reading. It could of course also be seen as an example of Communist/Anarchist art within the noble worker paradigm. 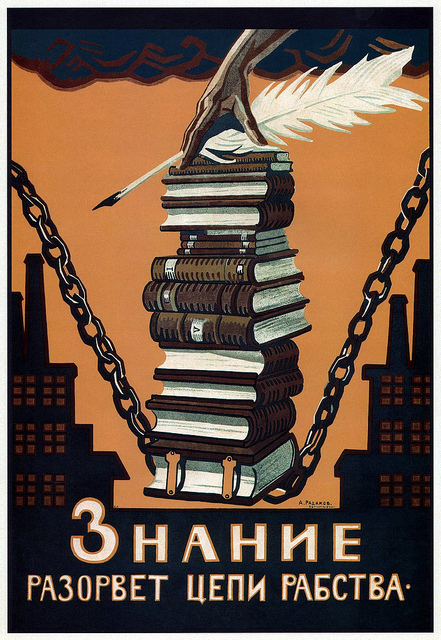 The worker studying revolutionary literature to improve everybody’s chances at getting better employment. Either way, I like the use of the term power within the poster. Whether it is a person’s individual potential or the power of the working class as a whole, it works. This was brought to my attention by this article http://gizmodo.com/read-to-win-the-war-13-vintage-posters-promoting-ameri-1481958684 which also links to the originals. I read with some surprise an article – Fleming’s vision: the first computer for Australian libraries – in the current November/December 2013 issue of InCite written by Ian McCallum of Libraries Alive! Now I would have thought that people writing for a library journal would have some more regard to the fact that librarians would naturally support librarianship as a profession. McCallum writes about librarian’s opposition to Allan Fleming’s becoming the senior librarian of Australia in 1970 as though somehow it was a bad thing. In fact those opposed to his elevation within the Concerned Librarians Group were sensible, correct and some of best librarians of the day. Any attempt to make out they were anything less is ill-judged. Those upset at the appointment were rightly concerned that instead of any of the highly qualified librarians in Australia getting the job, it was instead delivered as a gift from a politician to an unqualified but clubable ex-spy who’d been in the army and gone to the right school. As to the further claim in the article that Allan Fleming was some sort of computer visionary who brought computers to the NLA, well really. Major libraries worldwide were already of course getting computers, and the NLA would have gotten them whomsoever was in charge at the time. And in fact the first major Australian library to computerise their holdings was the U Syd Library run by the exceptional Harrison Bryan. The same Harrison Bryan (a later DG NLA) who didn’t get the position in 1970 because it went to Fleming. Before and during Fleming’s time in libraries, there was a group of librarians running Australian libraries of a calibre not before or since seen. These librarians including Bryan, Whyte, Sharr, Horton, Balnaves and Pat and Ted Flowers wrote well and often, were respected in their fields and by the wider academic community and were also respected enough to be routinely asked to serve in a range of capacities by governments and organisations who recognised their knowledge and skills. Fleming no matter how benevolent he was does not deserve to be in their company. Addendum, this attack on ‘concerned librarians’ also now appears in the latest issue of the Australian Library Journal – extraordinary! We all know librarians hate stereotypes of librarians, which is why some are compelled to indelibly ink their skin and post public pictures of themselves or anonymously tell the world that they don’t like library patrons. I’m not sure what they’re trying to prove with this, since basically no one but librarians cares about librarian stereotypes, and all the tattoos in the world won’t change anyone’s opinion. For the last x many years so many in the library profession have been whining about the ‘librarian stereotype’ of the severe older lady, the shoosher, the hairbunned spinster, the attractive man in tweed, etc. that was presented in the media. It was not a stereotype that ever really connected with the public because they actually deal with librarians in all their diversity. But some librarians, they take it all so seriously. In recent years there has been elicited huge joy at the number of librarians who don’t fit the stereotype, through their hair, clothing, tattoos, makeup, muscles etc. Doing this is all very well, but is problematic as it is merely based on how people look and not how they perform or are perceived. Of course, everyone should dress how they want, but this is just personal choice and shouldn’t be linked to the profession as a whole. How about we develop a stereotype for librarians as professional, focussed, knowledgeable, disciplined, technology capable etc. ? do you know a hipster librarian? I just hope none are found. After reading Morrissey’s long awaited Autobiography, I am a little sad to report that there is not much said of libraries nor the role they have played in his life and art. There are yet two mentions, but no real exposition. 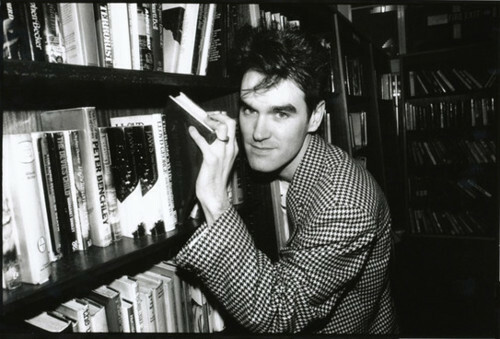 In past interviews, Morrissey has mentioned that his mother (Elizabeth Dwyer) was an Assistant Librarian but there is no discussion of this in the book. Disclaimer: This blog is produced in a purely personal capacity and does not seek to represent the views or opinions of the contributors' employers.